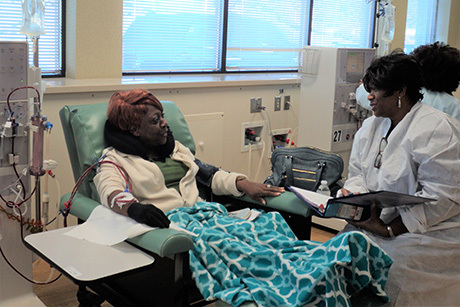 On Tuesday, Oct. 3, 28 patients with end-stage renal disease (ESRD) arrived at Emory Dialysis Center at Candler to receive dialysis treatment. They had traveled to Atlanta from St. Thomas, one of the U.S. Virgin Islands devastated by Hurricane Maria. When the St. Thomas patients arrived at the center, they were each assessed and triaged by nurse practitioner Linda Turberville-Trujillo and by Janice Lea, MD, chief medical director of Emory Dialysis and a professor of medicine in the Emory University School of Medicine. "A lot of these people weren't just displaced—they lost everything," says Marshia Coe, chief operating officer of health systems management, who manages the Emory outpatient dialysis facilities. "On top of that, some of them hadn't received adequate dialysis in several days. For an ESRD patient, proper dialysis can mean the difference between life and death." In order to accommodate the new patients, Emory Dialysis opened an additional shift and requested volunteers to work overtime. "A huge number of team members volunteered to help," says Coe. "I think a lot of us had the realization that this could have happened to any of us, or our families." "It was clear that our patients and their families were very appreciative, despite enduring much hardship," says Jeff Sands, MD, Department of Medicine nephrology division director and professor of medicine. "I'm tremendously proud of Emory's patient care staff, lab technicians, administrators and physicians for demonstrating such extraordinary competence, professionalism and compassion in a time of crisis." "We're still receiving calls about hurricane admissions," says Lea. "We're not sure how long these patients will be with us, so we're discussing bringing in additional staff and volunteers moving forward. We want to help however we can." Lea says that Emory Dialysis Center will continue to admit patients displaced by the hurricane as long as they have availability.